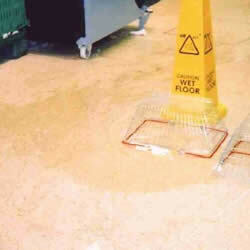 On 29 July 2002 an Environmental Health Officer (EHO) visited a leading retail organisation and noticed two large areas of wet flooring adjacent to some chiller cabinets. An attempt to mark the extent of the areas and exclude people had been made using yellow cones, wire hand baskets and produce trays. These measures were unsuccessful as people were walking through the water. The EHO decided that a formal approach was necessary and returned later that afternoon to investigate further. On arrival it was clear that the situation had not improved and it was established that the chiller cabinet condensate drain had been leaking onto the floor all morning. Advice was given to the manager about practical measures to keep the floor dry i.e. station a cleaner in the area at all times until the leak is repaired and use absorbent materials such as piles of hand towels or purpose made absorbent sausages to soak up/contain the water. By the time the officer left the store the floor was dry and the situation was being effectively managed. The company had a spillage procedure and this clearly set out the ways in which the manager should have managed the leak and the wet floor.